Use the MAZI toolkit to make your own MAZI Zone. This section of the website provides a list of hardware and items to buy, links for downloading the toolkit image software and the application software, and instructions to put it all together. There are ideas for what to do with your own MAZI Zone. Once your zone is built, you need to let people know about it, so you will also find templates for posters and publicity materials. Link to detailed notes on suggested products. This is the recommended option for most people interested in deploying a MAZI zone. It should not take more than a few minutes to complete. ( A full list of other available images is here. Open etcher and click Select Image to choose the mazi img file. 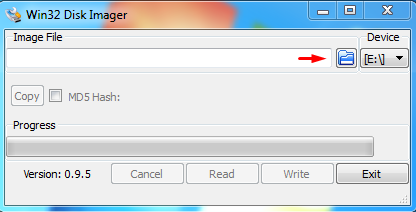 Choose SD Card as Drive. As soon as the process is finished mount the SD card on the Raspberry Pi and turn it on. 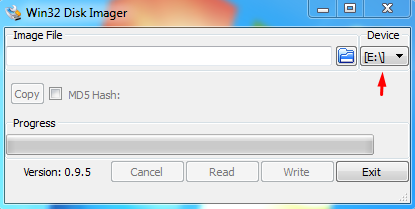 Please note that the use of the dd tool can overwrite any partition of your machine. If you specify the wrong device in the instructions below, you could delete your primary Linux partition. Please be careful. To see what devices are currently mounted. 2. Insert the SD card and run df -h again. The new device that has appeared is your SD card. The left column gives the device name of your SD card. It will be listed as something like /dev/mmcblk0p1 or /dev/sdd1. The last part (p1 or 1 respectively) is the partition number but you want to write to the whole SD card, not just one partition. You therefore need to remove that part from the name, getting, for example, /dev/mmcblk0 or /dev/sdd as the device name for the whole SD card. Replacing sdd1 with whatever your SD card’s device name is (including the partition number). 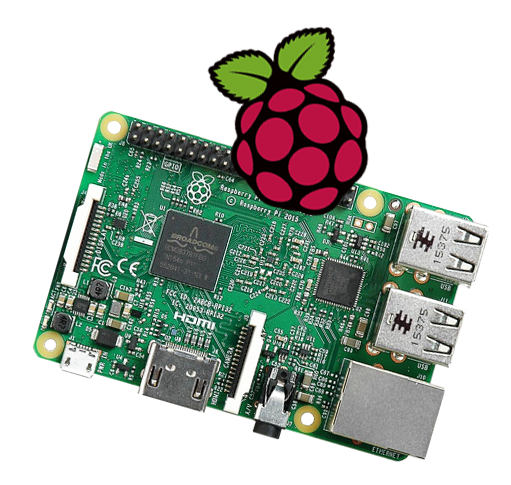 Raspbian is the Raspberry Pi Foundation’s official supported operating system. Find out more at the Raspberry Pi website. This option is recommended only for developers, or technically advanced MAZI toolkit owners who want to learn about the MAZI technical approach, and possibly contribute to the toolkit development. Detailed guidelines on the MAZI Guides site. 1. Insert the microSD card into the slot of the Raspberry Pi. 2. Optional: Insert the USB wireless adapter with external antenna (if you have a Raspberry Pi 2 or wish to operate in dual mode without ethernet cable). 3. Power up your Raspberry Pi and wait about 1 min to let your MAZI Zone start. 4. Search for the WiFi name (or SSID) “mazizone” and connect to it. — Set the administrator password. The default user name is: mazi_admin and the current default password is “1234”. Make sure to save the new password for later use! — Set the correct date/time. This is important for your MAZI Zone to work correctly, especially in offline mode. — Set the network WiFi name (SSID) of your MAZI zone, if you want to customise it. This is optional. 7. Click “Submit” and you will be directed to the admin login page inside the MAZI portal. Note that the admin username is “mazi_admin” and the password the one you just set in the previous step. Don’t forget it! 8. Start using your MAZI Zone! As an administrator of your MAZI Zone you have access to a wide range of configuration options that will help you personalise your MAZI Zone. To do this you should visit: http://portal.mazizone.eu/admin/ This is only available if you are connected to your MAZI Zone. Perhaps your first customization tasks will be related to Applications (decide which applications appear in the front page and customize the corresponding texts describing their role) and Networking (change WiFi name and the portal URL, e.g., http://here.now, and connect your MAZI Zone to the Internet. More information about this step is available in the “Documentation” menu on the admin panel of your MAZI Zone (see above). Every MAZI zone has a set of pre-installed FLOSS applications, like Etherpad and NextCloud, that will be accessible by those (and only those) connecting to your MAZI Zone. MAZI is developing also a specialized MAZI Zone application called mazi-board or “Guestbook“. 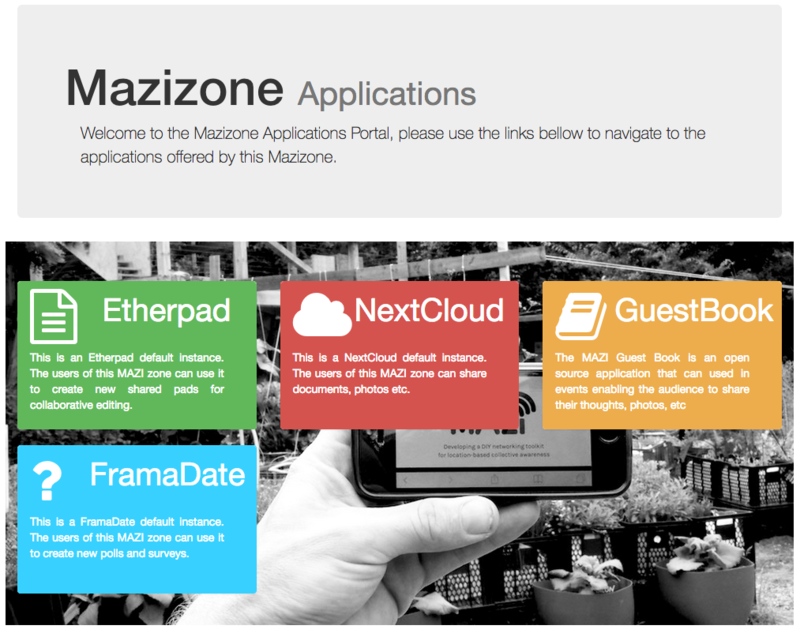 You can either let the users of the MAZI Zone choose which applications they prefer using, or narrow down their choices to help create a critical mass of people using the same applications, in this page, when connected to your MAZI Zone: http://demo.mazizone.eu:4567/admin_application (the corresponding URL leads to the demo page in which admin actions are not recorded). You can also try the currently installed applications on the public demo server: http://demo.mazizone.eu:4567/index (for Nextcloud the test account is user: test pass: mazizone. Please contact us at contact@mazizone.eu if you wish us to pre-install your favourite FLOSS application in future versions of the MAZI toolkit. 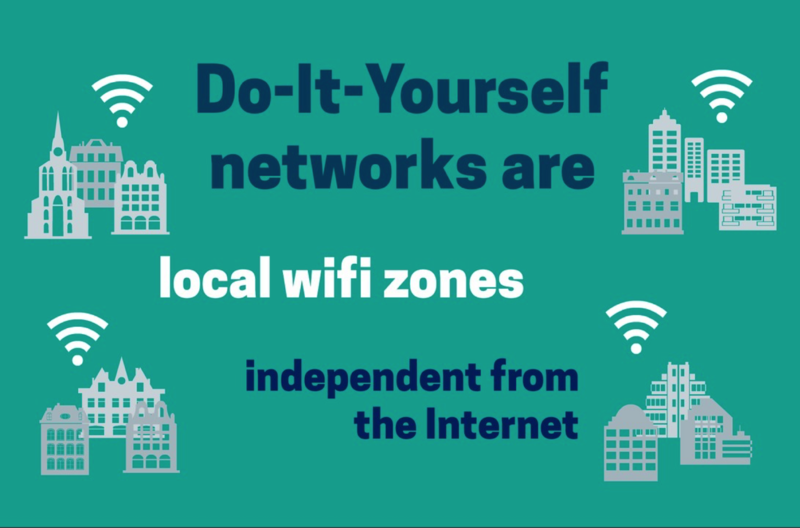 Let people know that your MAZI Zone exists, and consider ways to demonstrate how to use and participate in interactive local services of this type. The MAZI toolkit includes three types of additional documentation to this end, which is currently under construction in the following documents (feel free to add comments/suggestions).